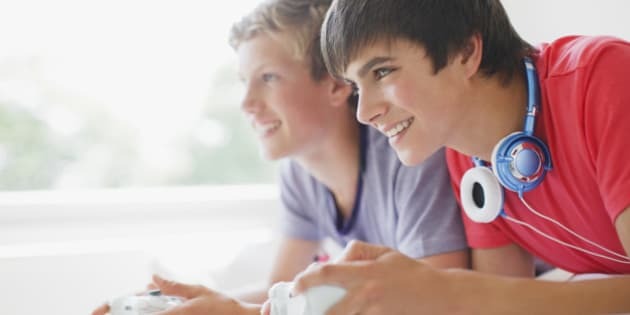 Not a kid, not yet an adult, which makes teens are pretty hard to buy games for, since most of the ones they want are rated mature, which are theoretically for gamers 18 and older. Obviously, every teenager is unique and there's a huge difference between 13 and 17. So as with all other aspects of parenting, the decisions as to which game to purchase should be made based on the age and maturity of your own particular offspring and what you deem acceptable in your own household. That said, there are plenty of games which are specifically rated “T for Teen,” so here's a list of the best ones we've played this year, which are all good bets for this holiday season. 1. "Assassin's Creed IV: Black Flag"
Is there a better bait-and-switch history lesson than virtual assassinations? Probably not, at least not for teenage boys. The Montreal-made "Assassin's Creed" series has always combined historical high-brow with visceral low — it's right there in the title — and this latest entry is no different. What is different is the new focus on piracy. Naval battles were a minor but much-loved feature of "AC III," set during the American Revolution, and they've taken centre-stage in this 1715 sequel starring you as proper pirate of the Caribbean. Though Havana, Kingston and Nassau are fascinating, historically accurate simulated cities, the best part of the game takes place on the high seas. The game's post-release plunder includes the Dec. 17 downloadable expansion "Freedom Cry," in which you play as a free slave from Trinidad who becomes a pirate. 2. "The Legend of Zelda: A Link Between Worlds"
Talk about a link to the past — literally. The latest adventure for Nintendo's autostereoscopic handheld console (meaning it pulls off 3D without needing special glasses) is a direct sequel to the beloved, if primitive 1992 Super NES classic "The Legend of Zelda: A Link to the Past." But while the familiar setting and top-down gameplay offer a nostalgia blast for older fans, that's not why this umpteenth visit to the kingdom of Hyrule to rescue its forever endangered princess Zelda is one of the year's most critically acclaimed. Rather, it adds enough innovation (including non-linear exploration and the ability to turn Link into a 2D drawing) on top of its imitation (of then-ahead of its time game design) to craft a gameplay experiences that makes it a must-have for "Zelda" fans of any age. For Wii U owners hoping for their own "Zelda" hit, Nintendo has also remade their Gamecube edition, "The Wind Waker" in full HD to mark the game's tenth birthday. Remember when "Guitar Hero" took up all the space under the Christmas tree with its giant plastic controllers shaped like guitars? Well, "Rocksmith" is kinda like that, except with actual guitars. In fact, if you don't have your own guitar or bass to plug in, you can buy a $200 version that comes with an Epiphone Les Paul Junior. Either way, the award-winning "Rocksmith" is promoting itself as the "fastest way to learn guitar" (their method is dubbed the "60-day challenge") and so it's at least a far better use of a teenager's time than simply getting good at pushing buttons. The new "Session Mode" lets you play with an AI band that can react to what you're playing when you're not jamming along to 50 familiar hits (plus many more downloadable song options) ranging from Aerosmith to Nirvana to Weezer. While not quite up to the impossibly high standard the beloved Brits of Rocksteady set on the previous two games in this series, Warner Brother’s new Montreal-based studio still does right by Dark Knight (except for that damnable Deathstroke boss battle). This prequel takes place in the sprawling sandbox city of Gotham just two years into his career while he was still learning the ropes, was considered more myth than man and had yet to face off against much more than street thugs. Using much of the same gameplay techniques pioneered in the previous entries, as well as the general Gothic aesthetic, "Origins" shows how Batman met many of the members of his now-infamous rogues gallery, including The Joker and Bane, after a bounty is placed on his head one deadly Christmas Eve, a plot date that also makes this a perfect present to put under your tree. For their first time in the WWE ring, having bought the license after THQ went bankrupt last year, 2K make a number of minor updates and optimizations to the long-running wrestling series while retaining popular features like "create-a-superstar." But the game's real finishing move is the all-new single-player campaign called "30 Years of Wrestlemania" which pays homage to professional wrestling's main event with 46 historical matches dating back to the company's '80s heyday as the WWF. For young wrestling geeks who missed watching those legendary battles on pay-per-view -- Hulk Hogan vs. King Kong Bundy, “Macho Man" Randy Savage vs. Ricky "The Dragon" Steamboat or Bret "Hitman" Hart vs. “Stone Cold” Steve Austin – this game is a win-win. Hideki Kamiya, the man behind cartoony classics like "Viewtiful Joe" and "MadWorld," takes a stab at a Nintendo game with “Wonderful 101," a knowingly campy, combat-based game inspired by Japanese TV and movie serials known as tokusatsu (think Might Morphin Power Rangers) and kaiju (think Godzilla vs Mothra). The player is 101st superhero who controls the other 100 in defending the world from invading aliens. The combat-heavy gameplay involves drawing on the Wii U’s touchscreen controller to turn the horde of heroes themselves into enormous weapons. Chaotic, colourful, and admittedly kinda confusing — hence the mixed review scores — the challenging game is nonetheless a good bet for action-loving teens who own the console and are into Japanese culture. 7. "Injustice: Gods Among Us Ultimate Edition"
Fighting games are the original multiplayer entertainment, and nobody fights quite like superheroes. The twist here, however, is that this time they're fighting each other. Using the alternate-reality template set by DC's Elseworlds imprint which take place outside of the comics' usual continuity, as well as the the 2D fighter gameplay established in "Mortal Kombat," "Injustice" uses an original storyline to justify its heroes vs heroes set-up. After the Joker tricks Superman into nuking Metropolis, accidentally killing his pregnant wife Lois Lane, the Kryptonian murders him and establishes a fascist regime which inspires Batman to lead an insurgency. Superheroes from comicdom’s more familiar universe then show up, leading to a series of one-on-one fights in familiar locals like Atlantis, the Bat Cave, Fortress of Solitude and the Hall of Justice. The re-released "Ultimate Edition" includes all the extra downloadable content, including playable characters like Batgirl, Martian Manhunter, Zatanna and General Zod. The trouble with launch games is they rarely show off the graphical prowess of a new consoles. But that's not usually the case with racing games. and certainly not with the ffth entry in Turn 10's popular Forza series, which is about as pretty as one could hope for. But that's not why Forza 5 wins its race -- it's the because it metaphorically corners so well. While it's got plenty of assists (like a time-reversal option and a driving guide line for those who prefer a more arcade-like racer, like myself, it's also an ace simulator when you remove the training wheels to enjoy the photorealistic tracks, car and physics. But the real selling features are the game makers' collaborating with the beloved Brits of cult car show "Top Gear" and the innovative "drivatar" AI system which uses cloud computing to take the driving styles of friends and strangers alike to create the most human-like artificial intelligence to ever get behind the wheel of a digital car. In fact, your teen's drivatar may even be out there winning races while they get their homework done so they have no excuse.